A deadly bus explosion in Bulgaria targeting Israeli tourists, a bomb plot to kill the Saudi ambassador in Washington, and a ship carrying large quantities of arms to terrorists – what do these have in common? They are all examples of hostile action by a global Shi'ite terrorist network, which is larger and more organized than any Sunni al-Qaida-inspired group currently in existence. February 2012: Two Iranians turn an apartment in Bangkok, Thailand into an explosives factory and plan to assassinate Israeli diplomats. Their plan is botched after Thai police receive intelligence about the plot. One of the terrorists tries to flee police with explosives and loses his legs after a failed attempt to hurl a grenade at officers. His accomplice is later arrested in neighboring Malaysia while trying to board a flight. The men are currently on trial in Thailand. February 2012: The wife of an Israeli diplomat is seriously injured after a terrorist attaches a magnet bomb to her vehicle in New Delhi, India. Indian authorities have arrested an Indian-Muslim journalist with ties to the official Iranian Islamic Republic News Agency in connection with the attack. On the same day, an Israeli embassy staffer in Tbilisi, Georgia discovered a bomb underneath his car as he was driving to the embassy Monday morning. May 2008: Azerbaijan arrests two Lebanese Hizballah members for plotting attacks on the Israeli embassy in Baku. The men are later sentenced to 15 years behind bars. October 2012: Azerbaijan sentences 22 of its citizens to lengthy jail sentences after convicting them of assisting the Iranian Republican Guards Corps to plan attacks on the Israeli and American embassies. July 2012: Five Israeli tourists and a Bulgarian bus driver are murdered by a Hizballah bomber who attacked their tour bus at the resort city of Burgas. The attack occurs just outside of an airport, after the tourists landed on a plane from Israel. Bulgaria later blames Hizballah for the atrocity, and announces a manhunt for two suspected members of the cell who assisted the bomber. The bomber is killed in the blast. February 2013: A Cypriot court sentences a Lebanese national to four years in prison after he was caught making reconnaissance trips to the Mediterranean island's airport, to track and record the movement of Israeli passengers. The plot's intended victims and methodology closely resemble the 'soft target' approach taken by Hizballah in Bulgaria. April 2013: An Iranian travelling on a fake Israeli passport is arrested outside of the Israeli embassy in Nepal, after carrying out hostile reconnaissance on the premises. Israel is by no means the only target. In Africa and central Asia, the network has been caught red handed by authorities plotting attacks against Americans. The Shi'ite network can be directed against Western targets around the globe, should it be ordered to do so by Iran. It has sent weapons – sometimes via ships that deport from the Iranian port of Bandar Abbas – to Shi'ite and other Iranian-allied militias across the Middle East (including in Yemen, Gaza, Lebanon, Iraq, and Afghanistan). And it is taking an active part in the Syrian civil war, fighting on behalf of the regime of Basher Al-Assad. 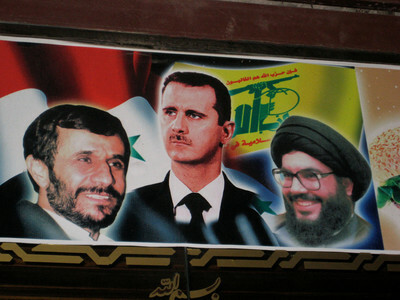 There are two main components to the Iran-centered Shi'ite terror network: The first is the Quds Force – the elite overseas arm of the Iranian Revolutionary Guards Corps, tasked with carrying out attacks, subterfuge, and arms smuggling around the world – and the second is Tehran's proxy in Lebanon, Hizballah. Both components are pursuing active terrorism missions overseas, as part of a covert war against Israel. If successful, these missions could end up triggering wider confrontations, destabilizing the Middle East further, and affecting global security as a whole. According to Israeli intelligence estimates, the two organizations have divided up their missions in the following manner: The Quds Force is attempting to strike official Israeli state symbols, such as embassies and ambassadors, while Hizballah's agents are moving against soft targets, such as Israeli tourists hubs. The Quds Force and Hizballah are in the midst of a secret but very real effort to carry out atrocities around the world. Israeli intelligence services are working around the clock to thwart them. Dozens of attacks have been intercepted by Israel in 2012 alone. One attack, a Hizballah bombing of an Israeli tourist bus in Bulgaria, succeeded in 2012, killing six people and wounding dozens. Over the course of 2011 and 2012, the Shi'ite terror network has gone into high gear, fueled by a desire to exact revenge for the deaths of Iranian nuclear scientists (Tehran blames these on Israel), and the assassination of Hizballah's field commander, Imad Mughniyeh in 2008, (which Hizballah blames on Israel). But while alleged Israeli covert action, as reported in the international media, was reportedly taken against those directly involved in threatening Israeli national security, the Shi'ite terror network goes after noncombatants, attempting to blow up synagogues, Jewish community centers, tourists, and diplomats. "Shi'ite terrorism is a threat to Israeli citizens and Diaspora Jews. The threat is being sponsored by Iran and Hizballah. Over the past two years, there has been an increased effort to carry out attacks," one Israeli counter-terrorism official recently said. "We are identifying a systematic campaign operating with the greatest vigor... They are fully coordinated. It is one axis," the source added. Israel has been in contact with countries that host significant numbers of Israeli tourists, such as India, and requested stepped-up security arrangements. In countries such as Azerbaijan and Nigeria, local law enforcement investigations revealed that Quds Force operatives recruited members of local Muslim communities to carry out surveillance and plan attacks. Hizballah, for its part, heavily relies on the Lebanese Diaspora to help facilitate its overseas operations. In February 2012, Nigeria's domestic intelligence service announced the arrest of an Iran-backed terrorist cell, naming three local Nigerians as suspects. The authorities said one of the suspects made several suspicious trips to Iran and interacted with Iranians in a "high-profile terrorist network" there. "His Iranian sponsors requested that he identify and gather intelligence on public places and prominent hotels frequented by Americans and Israelis to facilitate attacks," Nigeria's domestic security service said. In May 2012, the U.S. learned of an Iranian terror plot to use a car bomb and a sniper attack to murder American diplomats in Azerbaijan. Headed by General Qassem Suleimani since 1998, the Quds Force is under the direct command of Iranian Supreme Leader Ayatollah Ali Khamenei. It is believed to include some 15,000 operatives, and branches out like a spider's web into staff branches and regional headquarters, thanks to generous resources made available to it by the Iranian government. The Quds Force has been linked to the 1994 bombing of the Jewish Community Center in Argentina, in which 85 people were murdered. More recently, it has been behind a series of botched terror attacks on Israelis in India, Thailand and Georgia. These operational failures will not deter the Quds Force from trying again soon. The Quds Force's Special Operations Unit 400 is a particularly noteworthy entity, due to its assigned activities of organizing terror attacks beyond Iran's borders and its role in organizing, training, equipping, financing and directing Shi'ite, and sometimes Sunni terror networks. Iran's willingness to employ violence abroad came to international attention with the arrest of an Iranian-American citizen, who was caught attempting to recruit Mexican drug cartels to blow up a Washington D.C. restaurant, and assassinate the Saudi ambassador. Saudi Arabia, a Sunni powerhouse, remains one of Iran's most bitter regional foes, and the two countries are squaring off via proxies in the Shi'ite-Sunni battleground of Syria. Iran's attempt to partner with drug gangs in Mexico follows a larger association between Hizballah and Mexican narcotic cartels, allowing Hizballah to use drug profits to fund its weapons purchases and attack plans. The December 2011 indictment (in absentia) of Lebanese drug smuggler and Hizballah contact man Ayman Joumaa, for smuggling 85 tons of cocaine into the US and laundering $850 million for the notorious Los Zetas cartel, is a case in point. The activities of this network are truly global. Unlike the Sunni global jihadi terrorism movement, the Quds Force and Hizballah are state-sponsored, hierarchical, organized structures. The threat their ongoing efforts pose cannot be underestimated.